Best Brush for Huskies: Which Brushes Are Best for the Siberian Husky? You are here: Home / Health / Best Brush for Huskies: Which Brushes Are Best for the Siberian Husky? Part of owning a Siberian Husky is maintaining his beautiful exterior. Finding the best brush for Huskies helps him look good and feel good too. As you may have gathered from our intro above, yes, Siberian Huskies need brushing. Bred to withstand extreme temperatures, Husky dogs have a thick, double coat that sheds quite a bit. Huskies also produce body oils that can create a doggy stench if his skin and coat are not properly maintained. Furthermore, if your Husky is not brushed out regularly, the loose, shedding hairs could become overwhelming. They stick in your Husky’s dense outer coat, leading to mats and discomfort. Let’s take a closer look at your Husky’s unique fur. What Type of Fur Do Huskies Have? Huskies have a thick, double-layer coat that sheds year round. It sheds most profusely twice a year during the fall and spring months. The outer layer of your Husky’s fur is harsh to the touch. However, if you are able to get your fingers underneath this outer coat, you will feel a soft, dense undercoat. The undercoat is what keeps your Husky warm during freezing temperatures. His outercoat is weather resistant and keeps him cool in the heat. For this reason, never shave or cut your Husky’s fur. Many well-meaning Husky parents may think they are doing their dog a favor when they shave him down in the summer months. However, they are leaving his sensitive skin exposed to the sun, and vulnerable to sunburn and heat stroke. Having a consistent brushing and bathing routine for your Husky is all that is needed to keep his skin and coat healthy and his body temperature regulated. Now let’s take a look at how often you should brush your Husky. How Often Should You Brush a Husky? Due to the amount your Husky sheds each day, he will need regular brushing at least three to four times a week. However, during shedding season, he may need to be brushed out every day. But don’t worry. So long as you stay on top of your Husky’s brushing routine, the whole process from head to tail should only take about 10 to 15 minutes. Ready to learn about the best brushes for Husky dogs? Look at our list below. Double-coated dogs like the Husky will need a slicker brush to help get the loose hair, dirt and debris from the surface of their coats. An undercoat rake helps to penetrate dense fur and get the dead undercoat hair. You may also want to use a de-matting comb to brush out any pesky knots you are likely to find. One of our favorite grooming rakes for the Husky is the GoPets Two Sided Dematting Comb. This professional grade de-matting comb is wonderful for dogs with double-layer coats like the Husky for a number of reasons. For heavy shedders, like Siberian Huskies, this tool keeps loose hair at bay. It also helps you quickly and painlessly brush out any difficult knots or tangles you may encounter during the brushing process. We love that you can use this as a comb as well as an undercoat rake, so it’s like two brushes in one. Next on our list is the FURminator deShedding Tool for Dogs with Short, Medium or Long Hair. 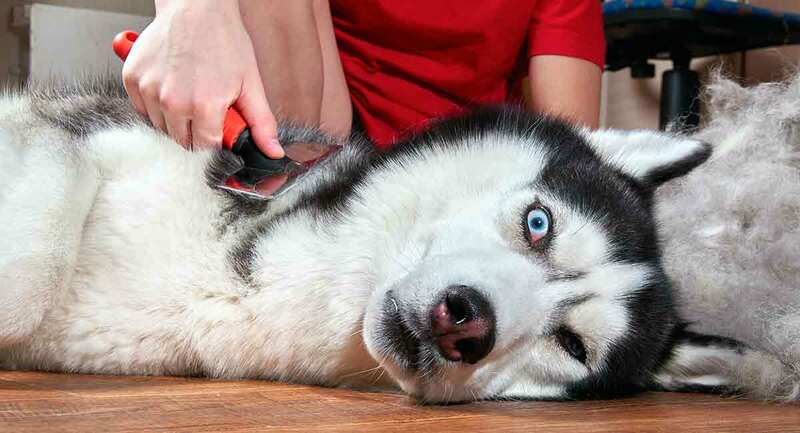 The FURminator is a popular tool recommended by a number of groomers for its excellent reputation for de-shedding thick-coated dogs like the Husky. This tool also comes with a “FURejctor button,” which makes cleanup easy and keeps the brushing process going. You will spend less time picking hair out of the bristles and more time brushing your Husky dog. Best of all, this product promotes healthy skin and hair by promising not to damage your Husky’s skin or hair during the brushing process. Another de-shedding tool we can’t get enough of for the Siberian Husky is the Pet Grooming Brush by Pets Neat. This de-shedding tool is a great one to have on hand for routine Husky brushing, as it has nearly five stars and boasts over 2,000 customer reviews. Promising to remove “up to 95% of dead hair and tangles” from your dog’s coat, this tool is a must-have for that stubborn dead hair your Husky is shedding all over your furniture. Also, this may just be the last de-shedding tool you will have to buy, because it is made with high-quality stainless steel. Speaking of quality, take a look at the Pro Quality Self Cleaning Slicker Brush for Dogs by The Pet Portal. This tool is excellent for both long- and short-haired dogs, making it a great choice for your dense-coated Husky. It is easy to clean and has a self-cleaning feature similar to that of the FURminator. This means that with one touch of a button all that excess Husky fur falls right out of your brush and allows you to keep on de-shedding. The brush bristles are soft and flexible, keeping your dog’s skin and fur safe while effectively removing all that loose hair from his thick coat. Best of all, this tool comes with a complimentary dog grooming eBook and a lifetime warranty. A money-back guarantee is an option if you are unsatisfied. And our final favorite brush for a Husky is the PawsPamper Extra Wide Undercoat Rake for Medium to Large Dogs. The extra-wide bridge makes brushing more efficient while the rounded blades mean there will be no skin irritation. There will also be no fur damage to your Siberian Husky during the brushing process. This is a wonderful de-matting tool that promises to leave your Husky with a “show quality” look. It is especially good for double-coated breeds. So, now that we’ve talked about the best Husky brushes, let’s talk about how to use them. Brushing your Husky must be done regularly, with most grooming experts recommending a good brush at least four days a week. However, depending on your dog and the climate, you may end up brushing your Husky as little as once a week or as often as every single day. Still, regardless of how often or how little you end up having to brush your Husky to keep his shedding coat under control, brushing doesn’t have to be difficult or time-consuming. Using the dog brushes we listed above, you can keep your Husky’s coat healthy and vibrant for years to come. We suggest starting at the head and working your way down to the tail. You can start with the slicker brush to loosen dead hair, dirt and debris from his fur first. Then brush thoroughly all throughout his body. Pay special attention to his bottom and his shoulder areas because these areas are where his hair grows thickest and may become matted. If it is shedding season, or if your Husky is a heavy shedder in general, you will want to follow up with the raking comb. This is the best brush for penetrating your Husky’s undercoat and getting any stubborn dead hairs out. And, as previously mentioned, if you stay on top of your Husky dog’s brushing routine, the process should only take 10 to 15 minutes. To acclimate your Husky to the brushing process, we suggest starting to brush him as a puppy. Use positive reinforcement, such as praise and treats, during brushing routines. This will help your Husky associate brushing with something positive. Hopefully, this makes the experience easier and an enjoyable bonding experience for both of you. It also gives you an opportunity to look your Husky over for any unnoticed cuts, scrapes or bumps on his skin. While brushing your Husky must be done regularly, it is not all that difficult. To watch a comprehensive video on the process of upkeeping and brushing your Siberian Husky, click here. As we discussed above, the Husky is a double-coated breed with a harsh outer layer of fur and a short, dense undercoat. He sheds all year and blows his coat most heavily during shedding season, which is typically during fall and spring. Since your Husky has a double-layer coat and is a heavy shedder, you will do best using a slicker brush, an undercoat rake and other de-shedding tools to best maintain his fur. Using positive reinforcement, praise and treats, brushing your Siberian Husky can be an excellent way to connect with your four-legged friend.